So Paul explained to them that this future time of tribulation had not yet come because a certain “man of lawlessness” had not yet been revealed (2 Thessalonians 2:3). Comparisons with other passages in Daniel, Matthew, and Revelation reveal this man to be none other than the Antichrist. But Paul encouraged the Thessalonians not to worry, because the Antichrist would not come until a mysterious restrainer—the Thessalonians apparently knew his identity—was removed from earth (2:6-7). The identity of this restrainer has been heavily debated, though due to the nature of the work the restrainer does, He is likely the Spirit of God working redemptively through the church. When the believers leave the earth in the rapture, all who remain will experience the wrath of the tribulation. Paul knew that hope in Christ would encourage perseverance in godly living. And hope is exactly what we lack today, one of the great roots of this gradual slip into increased self-centeredness. As you read the words of 2 Thessalonians, allow them to rekindle your hope and fan into flame your desire to live in God-honouring, industrious ways. 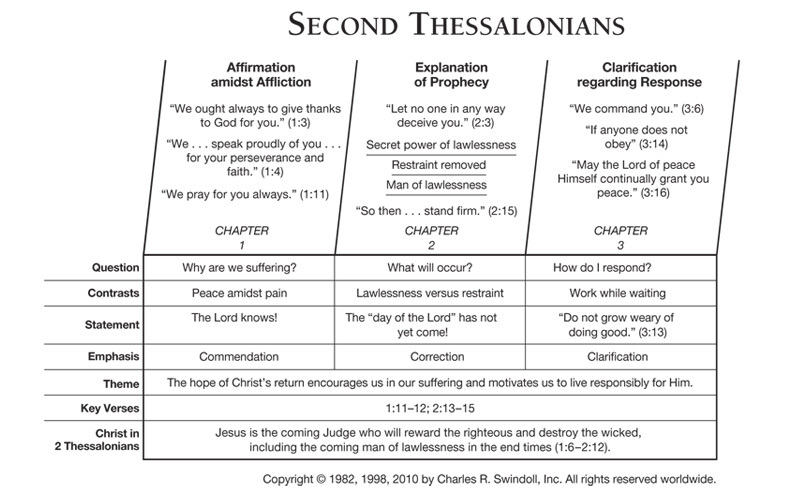 Find resources in the book of Second Thessalonians in our resource library.